We are rolling right along with the ball unit! Our topics the past couple of weeks involved people who use balls, and the materials that make up balls. Construction crews use balls for demolition, and people use balls for sports and entertainment. I took the class on a virtual field trip to a construction site to watch a steel wrecking ball demolish a building! We learned that people use balls for work and for play. One of the highlights of this unit was watching Mr. McWilliams juggle tennis balls for the class. We watched him juggle two balls and then three. I love to have parents in the classroom to share their talents. After we watched and learned about juggling, Mr. McWilliams gave each child their very own ball. A special thank you to our special visitor. A few of our favorite balls were made of plastic, rubber, and bubbles. I used this unit to increase our gross motor skills with a balance activity. Each child had to balance a plastic ball on a wand. 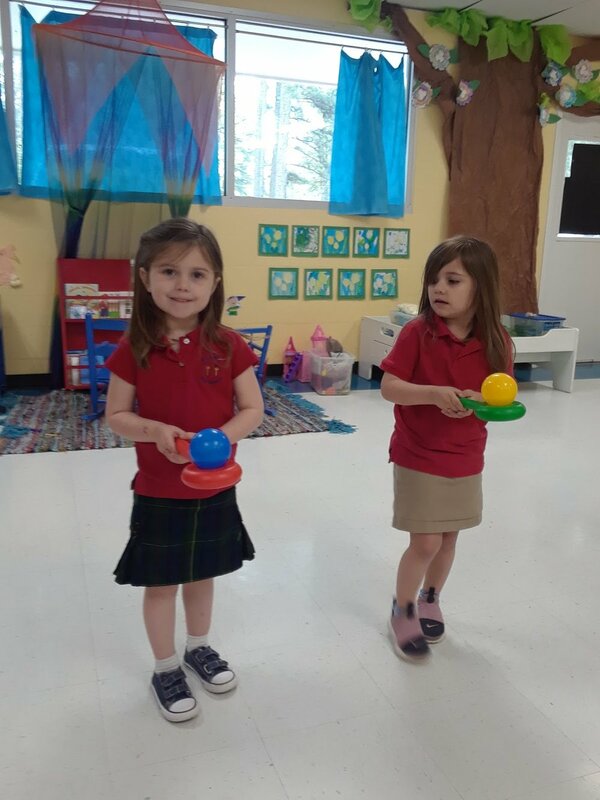 Balance and coordination activities helps each child to develop self-regulation for daily tasks. Attention and concentration were maintained for a specific task during this game. Mrs. Nicole let us borrow her reaction ball for a great class activity! Our reaction ball was made of rubber and it had knots all around it. As your child dropped the ball, it reacted differently every time. The reaction ball may bounce to the left or right. 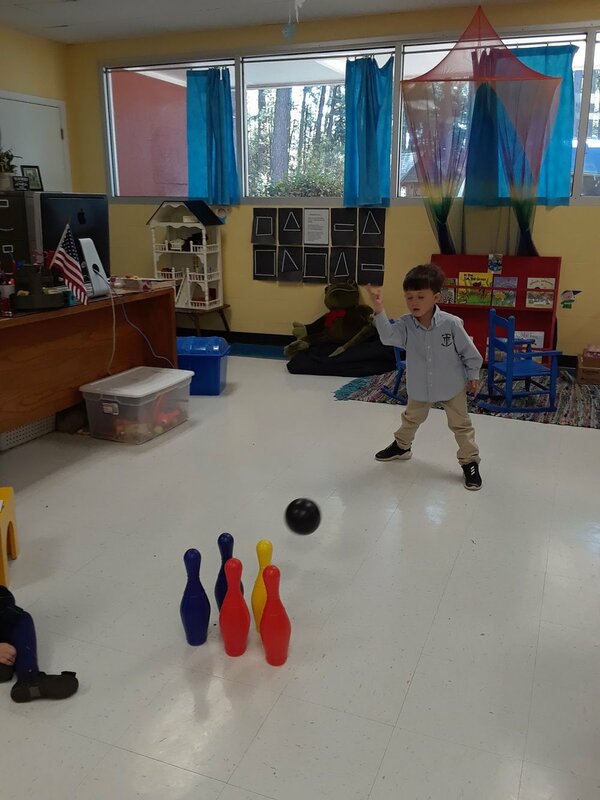 As we moved to catch the reaction ball we improved our eye-hand coordination and our reaction time. 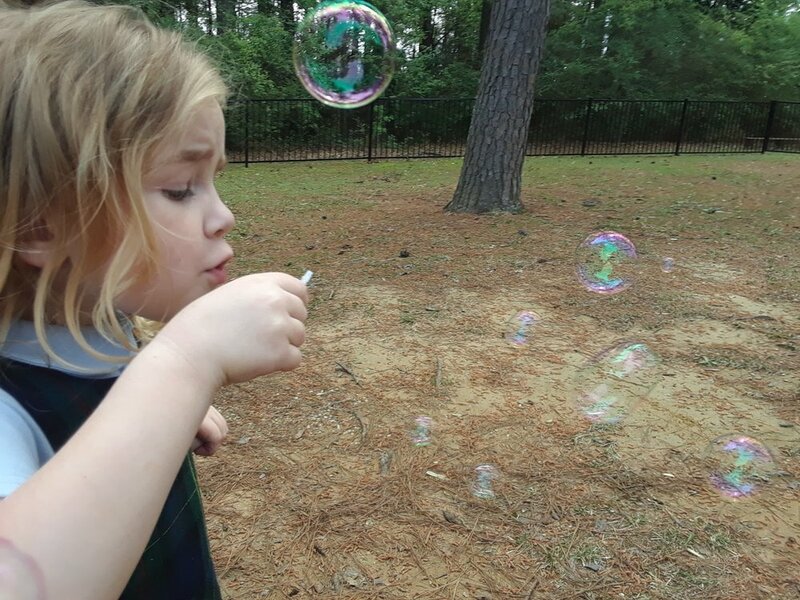 Spring is a wonderful time of year for a science lesson! I ordered caterpillars a few weeks ago and we have watched and waited for butterflies to emerge. We learned about the wonderful metamorphosis that occurs during the lifecycle of a butterfly. We learned that a metamorphosis takes place during the process from an immature form to an adult form in two or more distinct stages. It was wonderful to watch the miracle of nature. The ball unit has this class bouncing for joy! The past few weeks we have discussed types of balls that roll, bounce, and forces that make balls move. When it comes to bouncing a ball, we learned that balls made of air or rubber bounce the best. We determined that heavy balls like a bowling ball are solid and have no space for air. One of our favorite balls was a bowling ball, which I used to teach a math lesson. I believe that each child must have a hands on experience to fully grasp the concepts of mathematics. 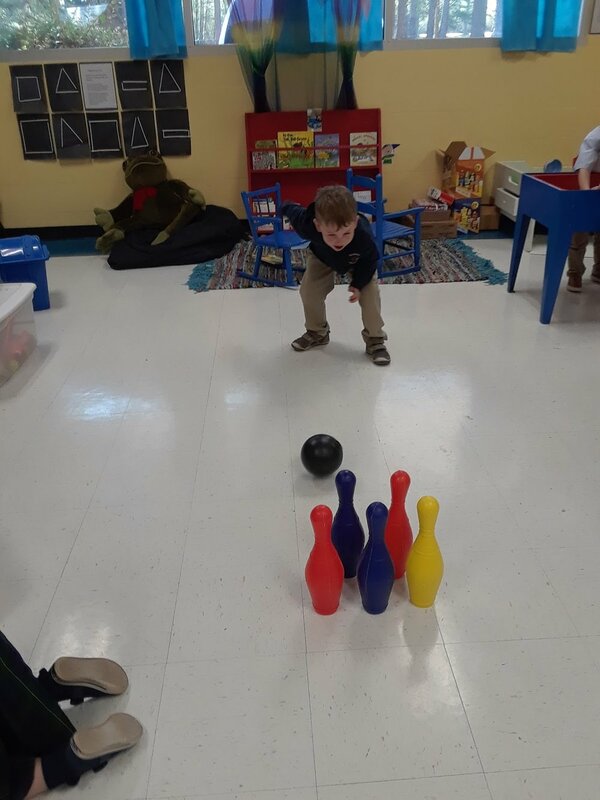 Each child had a blast as they counted the pins that were knocked down. 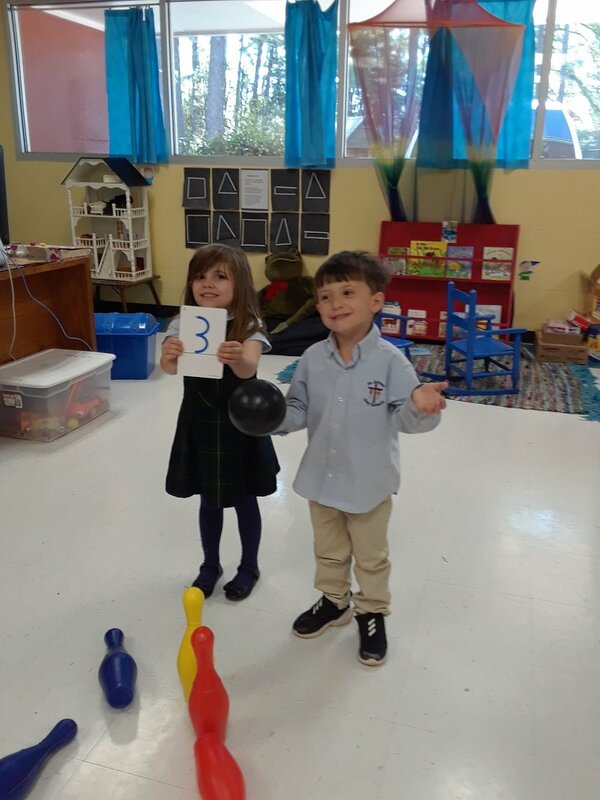 After they counted the pins that were knocked down they had to find the corresponding number card. The children worked in groups of two during this fabulous activity! 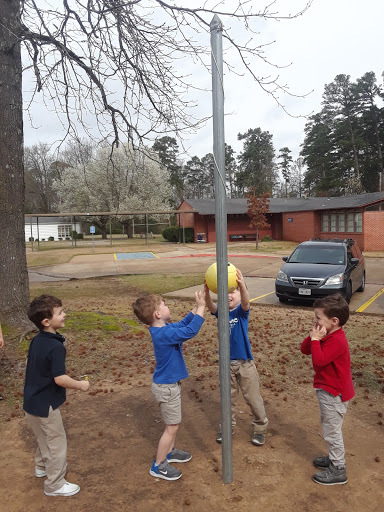 On our way back from the library, we noticed a tetherball pole. The children had fun taking turns with the ball! This game was a great way to instill the value of taking a turn. Each child was full of excitement as they played together. After all of our ball fun, it was time for a little geometry. One of my favorite geometry lessons involves play-doh! We had a great time with the play-doh as we played a game with impressions. I showed the children four items and then I had them close their eyes. I picked one item and made a impression with it in the play-doh , then it was time for my students to guess which item I used to form the impression. The children had to choose between a paperclip, quarter, dime and a button. After I played, “Guess What,” with each child, it was time for them to make their own impressions. This lesson involved geometry as we matched shapes of the same size and orientation. We also used algebra as we identified objects as the same or different. 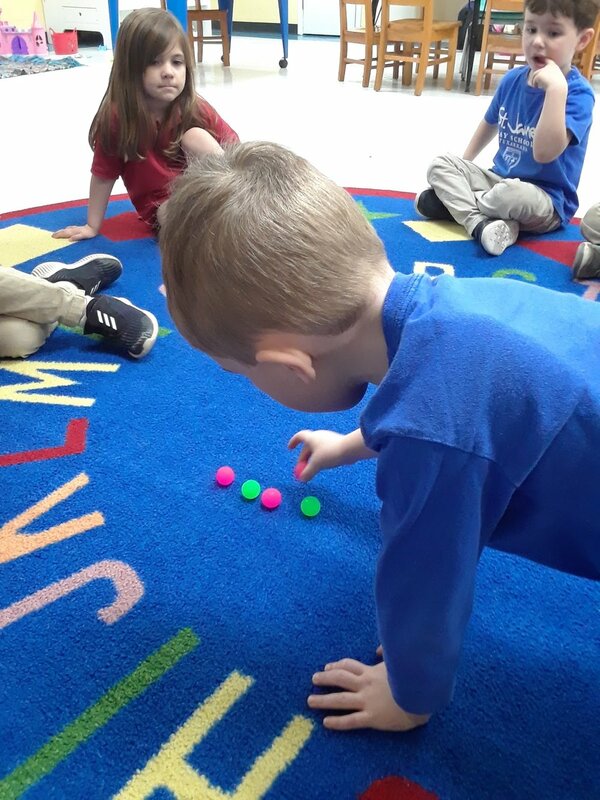 We ended the week bouncing for joy as we used bouncy balls to make patterns with colored balls. The class was thrilled to make AB, and ABC patterns! Buildings, Valentine’s Day, Grandparents’ Day and The Tooth Fairy , what a wonderful month! 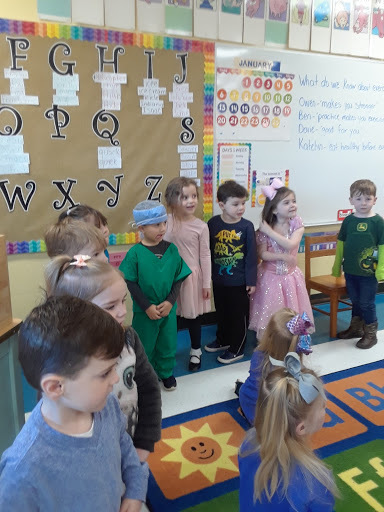 Our last topic had this class asking , “What happens inside of buildings?” We closed our building unit with a tour of the rooms in our preschool building. The class toured classrooms, counted windows and doors, and discussed the features that make up our preschool. We discovered that each of our classrooms has four square windows and every classroom has a closet that the teachers use for storing supplies. Mrs. Lisa let us in on a little puppet show fun in her class, and we were thrilled to see the exercise equipment in Mrs. Tracy’s room. A special thank you to my coworkers for letting us come in and explore each class. I can’t stress enough how important it is that your child is in an environment where the teachers help each other with studies. Our Valentine Party was full of fun! We also had a chance to practice a little name recognition as we searched for our friend’s names and placed their valentines in their boxes. A special thank you to Mrs. McWilliams , she was our room mom for February and she furnished each child with a canvas and paints to form a masterpiece. The Tooth Fairy stopped in for a visit! We were thrilled to learn how to care for our teeth. We learned to brush our teeth twice a day. Every special event is a learning opportunity as we classified and sorted foods that are good or bad for our teeth. Our music class with Mrs. Tipton had each child hitting the bongo drums. We learned that the larger drum makes a different sound than the smaller drum. We used our sensory motor skills in the block area as we built bridges. 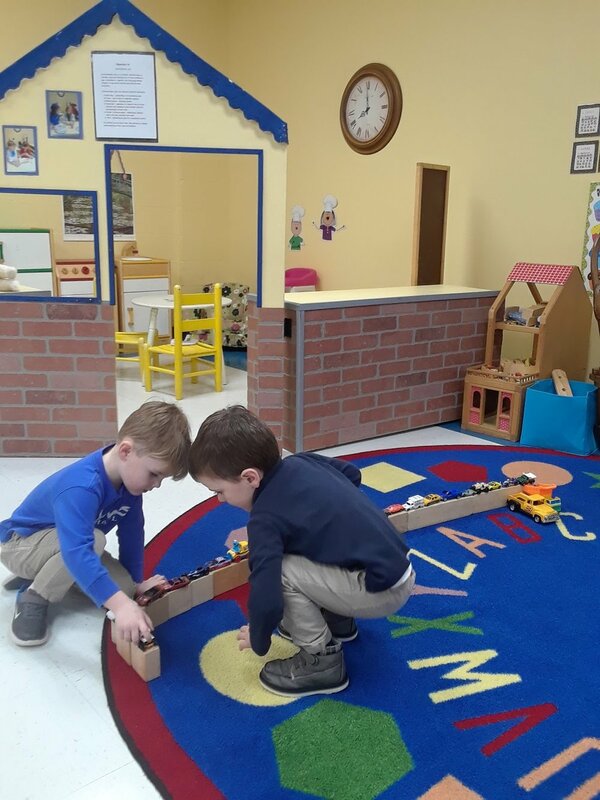 Each child had to reach for, grasp, and move blocks to form narrow and wide bridges. We had to problem solve, guess, and check to see if our cars and trucks would fit onto our bridges. We determined that our large truck would have to have a wide bridge. One of our activities this week had this class searching the alphabet. We played Same Sound Sort. I placed items in a container that started with the same letter. I called the children up and they had to take the item out of the container and tell me the letter that the item started with. 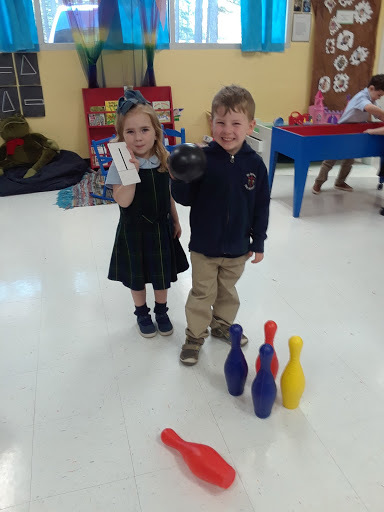 The snowman and the shamrock were big hits with our letter S. This game was fun because the children could not see what item they were pulling out until they had it in their hands. I was very proud of my students during our Grandparents’ Day celebration. It was wonderful to watch the children sing for their grandparents! I was thrilled to meet everyone and I was very proud of the class. 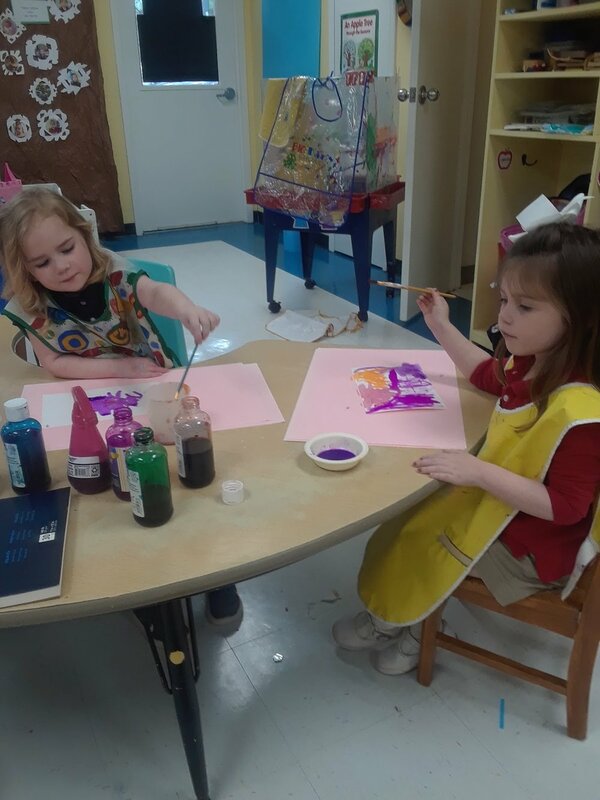 I know every grandparent was thrilled to come into the classroom and see all of our beautiful work, and I know the children were proud of their canvas paintings that went up for auction. Our next unit will have us bouncing for joy, as we learn about balls! The building unit had this class moving around campus. We took a tour of the buildings around our school and we noticed that shapes are all around us. Our windows are rectangles and squares. Our school doors are rectangles and the bricks that are used to make our cafeteria are rectangles. Each child noticed that our buildings had numbers and letters on them. During this tour your child noticed the various materials used to construct our school. We noticed that a library is in a building and this class stopped by and enjoyed a great book! The block center was the place to be and everyone could not wait to construct a masterpiece. 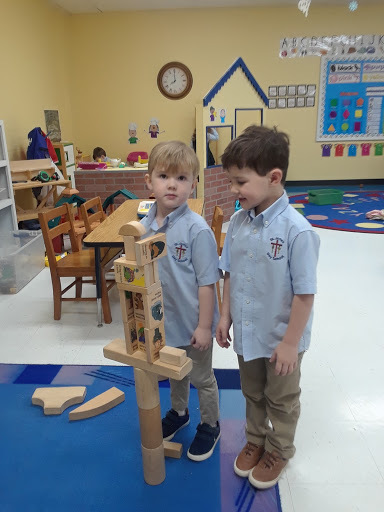 As the children build in the block center they are learning to work together to complete a task and respect others ideas. When I give the children a specific activity to do with a friend, such as building a zoo or a house, it helps both children practice cooperation skills. 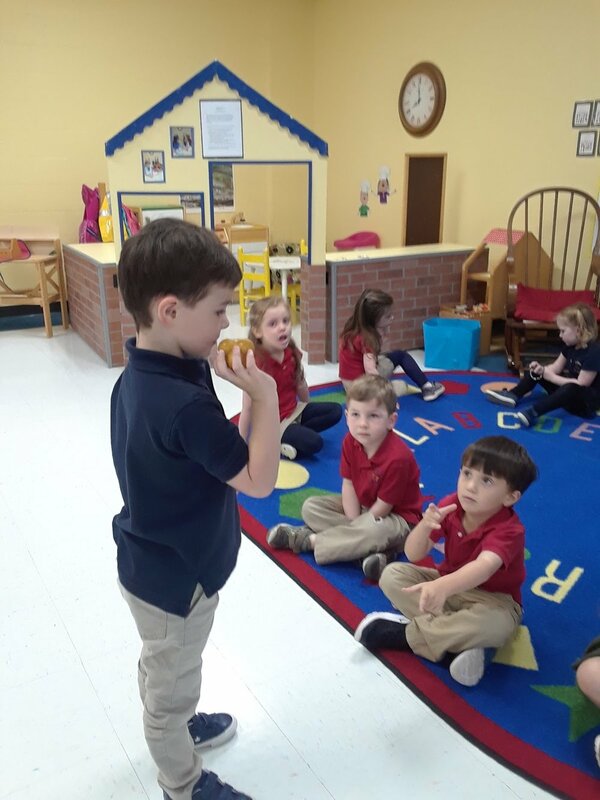 Our preschool day is much more than learning numbers and letters , we also work on building strong social skills. The sensory bin was full of action as we made our own snow. The children loved watching the chemical reaction as we mixed our snow powder with water. We had to measure two ounces of water to one small measuring cup to create our wonderful snow! This activity was a great science and math lesson. 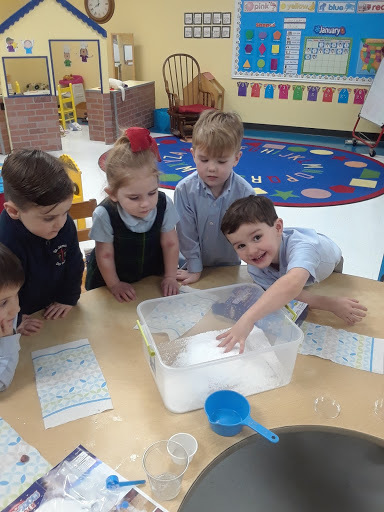 We learned that we had to mix exactly two ounces of water to have the snow form. We used measuring cups and containers that showed ounces of liquid. If we used two small measuring cups we needed four ounces of water. Math and science are fun! 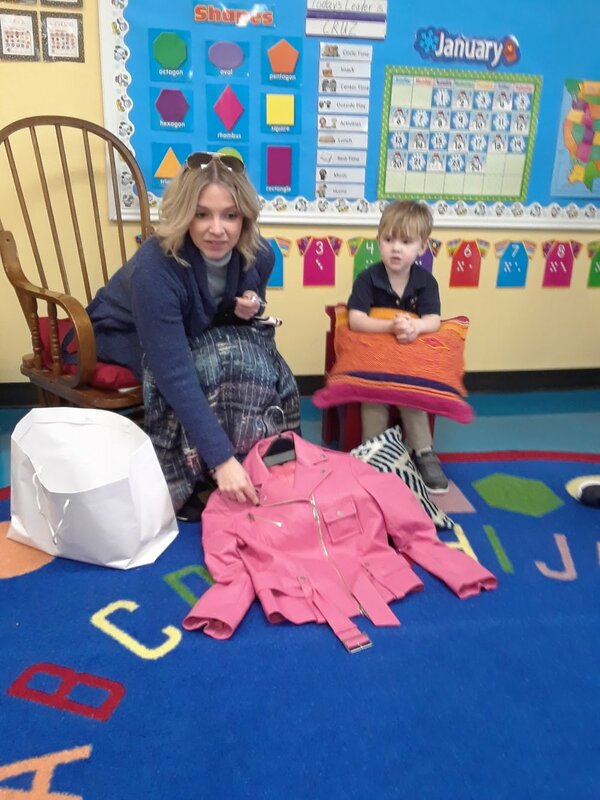 One of our study questions during the clothing unit was , “What clothes do people wear to work?” This class found out that community helpers wear uniforms , and certain schools require uniforms. 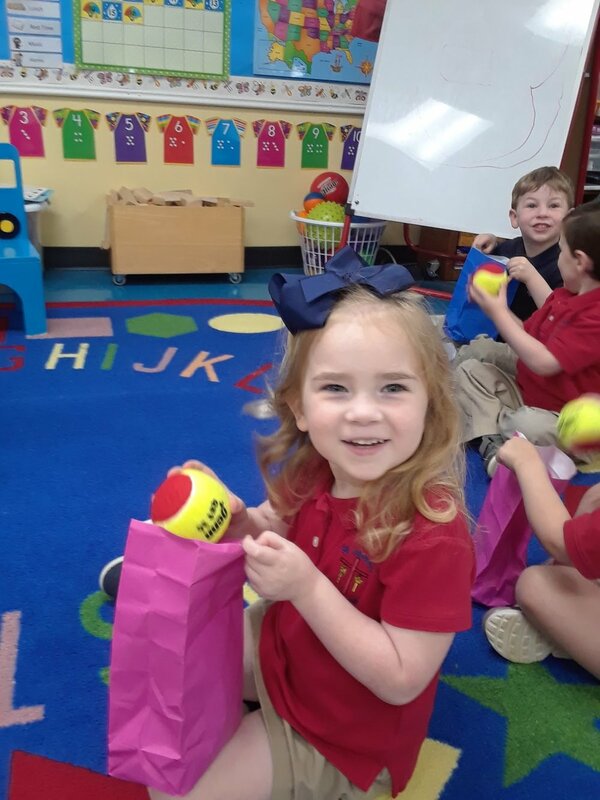 We love our St. James uniforms! Several of our parents wear dress clothes to work. 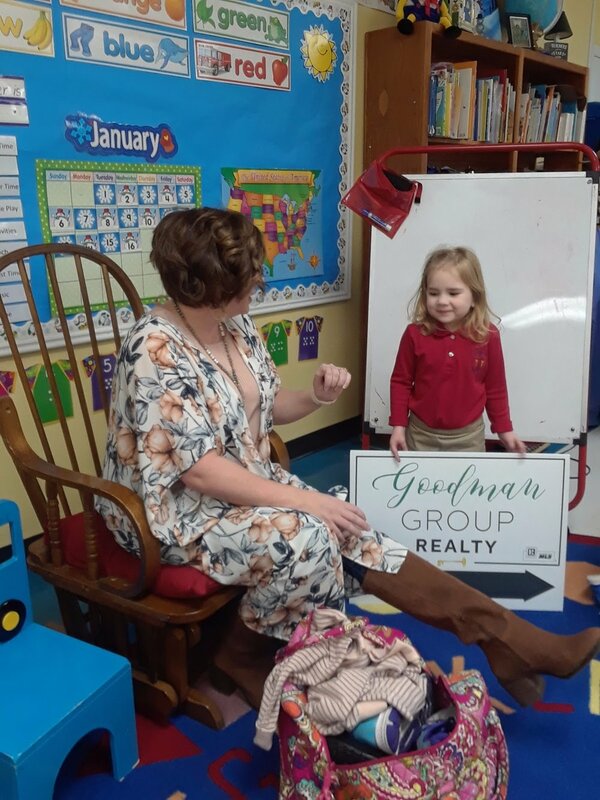 We were blessed to have a policeman, salon owner/ stylist, District Executive BSA, nurse practitioner, real estate agent, children’s book marketer, neonatal nurse , and a design consultant visit our class. A special thank you to all of our visitors. The class loved learning about the duties of each special visitor! As the clothing unit came to a end, I thought of a great celebration to close this unit. We had a fashion parade! We took a day off from our beautiful school uniforms and we were able to wear any clothing for our special day. The children paraded through all the preschool classrooms and we stopped by the kindergarten class, too! I must say we looked stunning in our cotton, silk, rayon, and polyester clothing! The parade was a blast , but also a learning experience for the children. 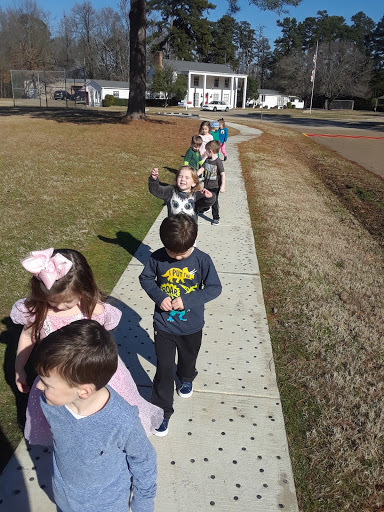 We practiced following the leader, staying in line, and greeting other teachers and children. One of our objectives for this unit had each child exploring geometric shapes with straws. We talk about geometric shapes everyday, but this lesson gave your child a hands on experience that will help them remember how shapes are alike and different. Children do not develop their ideas about shapes by sight only, they need to manipulate and compare in a variety of ways. Math and language go hand in hand in this classroom! One of our lessons this week had my tongue twisted. We learned that tongue twisters are phrases that are hard to say because the words sound the same. The children loved to hear me say , “She sells seashells down by the seashore.” Your child is learning the sound of letter “S” when they listen to me use the letter “S” several times. This lesson helped your child with phonological awareness. Phonological awareness is an important skill in learning to read. Your child is becoming aware of letter sounds as I read and sing. Stay tuned as next week we will be moving on to our building unit.